Politico has an interesting piece today on the growing movement among Democrats to curtail public union clout. Like today’s WSJ editorial it focuses on Republican governor Bruce Rauner’s efforts to follow Scott Walker down the public pension reform path. What’s interesting is how many Democrats in state legislatures are waking up to the sustainability problem with the public union model. In November Democrat Gina Raimondo won the Rhode Island governor’s race after a bruising primary where she defeated two union-backed candidates who were hell-bent on keeping the union reformer out of power. Raimondo is Rhode Island’s first female governor; just as importantly though, she is clear-eyed about the problem with public sector unions and unabashed about taking them on and demanding key reforms. Like every brave blue state Democrat trying to convince her left flank that reality is the obstacle standing athwart their collectivist dreams, Raimondo faces an uphill battle and is probably going to lose in the end. Such is life when facing off against the naked self-interests of a rabid and entrenched opposition. Chicago Mayor Rahm Emanuel is nobody’s idea of a conservative, but he is fully aligned with Rauner in opposing the nasty Chicago Teachers Union, which needs corrupt legislators to rubber-stamp their collective bargaining scheme in the same way that humans need oxygen. Emanuel and Rauner are old colleagues, so the union left will say this is just more cronyism to fatten their own coffers by attacking unions. But any honest appraisal of Illinois politics will show that public unions exist first and last to expand the state bureaucracy, demanding always more money for pensions and benefits and higher taxes to pay for them. As a result, Illinois has the worst pension crisis of all the states and is considered a wasteland for business and economic growth. Neighboring Indiana and Iowa have so thoroughly outperformed Illinois this century that some Democrats in Springfield acknowledge the need for reform. San Jose Mayor Chuck Reed offered an admirable sentiment after “clash[ing] with public employee unions” in California when he said that “there’s a difference between being liberal and progressive and being a union Democrat.” Is there really, though? The hard truth that confronts the left is that they are not a viable political coalition without the millions of dues-paying public union members contributing millions to keep Democrats in office. At the federal, state and local levels, union leadership as well as the rank and file line up behind Democrats at astonishing rates. Take a gander at candidate contributions by federal bureaucrats (especially the lawyers) in the last presidential election. And what happens if the miracle occurs and Democrats abandon their corrupt union practices and admit that they are more responsible than anyone for the epidemic of blue state pension and budget fiascoes? Do they go full retard and devote their entire political project to identity politics and the cultural fetishes of cloistered academics? I mean, I welcome it should it transpire, given that a politics that doubles and triples down on postmodern relativism and political correctness is a political movement not long for this world. The only practical solution for the 21st century left is a complete re-think and overhaul of their approach to the economy. I am not confident or optimistic this will happen, committed as the left is to a religious conviction that they are constantly beset by a rigged system and the culprit is capitalism. Going back to the San Jose Mayor’s comment, I’m genuinely curious to learn what a liberal or progressive not in thrall to the romantic ideal of the trade union looks like. The left’s overriding ethos is that power and wealth are unfairly concentrated at the top, where “owners” exploit “workers” with their unearned capital accumulation. Marx was adamant that capital could only be accumulated through theft, and that impulse is alive and well with today’s left. The romance of the unions is all about leveling the field, sticking it to the fat cats via labor “solidarity,” strikes and bargaining power. It’s a zero sum philosophy with a cynical message: the wealth has been unfairly allocated to the rich few, thus the only recourse is to organize and plot to take back your rightful share. This line of thinking, beyond being juvenile and simple, betrays a fundamental lack of understanding of how market economies work. It obsesses over equitable distribution and is uncomfortable with the fact that life’s natural order is not fair. And it treats as obscene high profits and earnings, imagining that prosperity is best when it is shared; the point of politics then is to guard against unfairness wherever possible. That they fail to see how a system of perceived unfairness does in reality serve to foster the most broadly shared prosperity (see: America, The Unites States of) imaginable is a frustration we will likely have to endure forever. Unless of course the left is forced into reconsidering its economic perspective by blue state voters sick of living in stagnant economies where insane percentages of state budgets are allocated just to public employees and their lavish benefits. 25% of Illinois’ budget is swallowed up union costs. TWENTY FIVE PERCENT! And yet the Chicago progressive mob is adamant that taxes must increase along with spending, a tune that never changes regardless of the fiscal climate. This is the kind of blind, tone-deaf, oblivious political thuggery that is going to doom the left eventually. The question is do they see the writing on the wall and are willing to make adjustments to their chief economic plank, or are they going down with the ship? By all accounts, union leadership is going to fight to the death to coax every last possible dime out of taxpayers before they shuffle off into the void, but there are more encouraging signs among rank and file members as well as savvy Democrats in the states. The problem is at the federal level, where public unions are less strapped by finite state budgets and reap the rewards of an out-of-control government spending apparatus. But even the big federal players like Afscme and AFT can see that reformer governors in blue states where unions typically enjoy broad approval are finding receptive audiences among state Democrats who realize the union model is unsustainable. Mother Jones’ Kevin Drum laments the Democrats’ worrying trend with working class white voters and traces the discontent to lingering unhappiness with the Democratic tax and spend welfare state model. Drum accurately highlights how liberal obsession with food stamps, unemployment benefits, Medicaid and Obamacare can alienate working class whites as they see more and more assistance going to their marginally less well-off neighbors while they get nothing. Personally I think race has very little to do with what is really an economic and a government problem, but since the left can’t tie their shoes without noting the latent racism involved in shoelace production, they have to identify their middle and working class voter problem as one to do with the “white working class.” Fine. Whatever gets them to any level of introspection is only good news for the debate going forward. I wonder if the left will ever understand observable reality and change its mind on what constitutes helping the poor. Everyone with a conscience, left or right, wishes to see the plight of the poor improve, the question is how to achieve improvement. 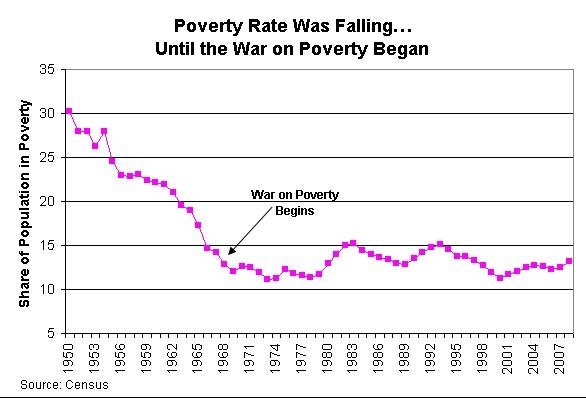 I (kinda, sorta) accept Drum and liberals at their word that their aim is true when they advocate for these government programs for the poor; my problem is with their stubborn refusal to be accountable and admit that the ambitious War on Poverty was a failure, especially if viewed in terms of trajectories – American poverty was steadily declining between 1945 and 1965, only to flatten after the Great Society was introduced. The line has remained flat for a generation. It is an insult to basic intelligence to suggest these programs were successful at eradicating American poverty. Possessing noble intentions does not automatically translate into good policy, but seeking well-intended results through government is guaranteed to create bad policy because government is inherently inefficient (and likely inherently stupid too). Whatever merits progressives assign to the Great Society are dwarfed by the incontrovertible fact that its biggest legacy is likely to be the destruction of the black family in America. And not just the black family, either. One of the more fundamental disagreements between left and right is over the matter of incentives. The left doesn’t bother with incentives because, if I may be so bold, they typically don’t care about how their policies cause people to behave; they just care that a policy they came up with is made binding on others. Or if you want to be more generous: the left doesn’t focus on behavioral incentives in law because they don’t believe such things exist. Since most leftists come from academia, they are used to theoretical models that deal in static data. The real world, however, deals in dynamic data, in that there is no way to account for the variable known as “human behavior” in academic models of society or the economy. Laws create behavioral incentives because humans are not robots. Just because it makes sense on paper to increase government spending in order to stimulate aggregate demand does not mean such policy will work in practice. In fact, we know it does not work because rudimentary market economics informs us that government intervention into the economy only creates distortions and mis-allocation of resources. 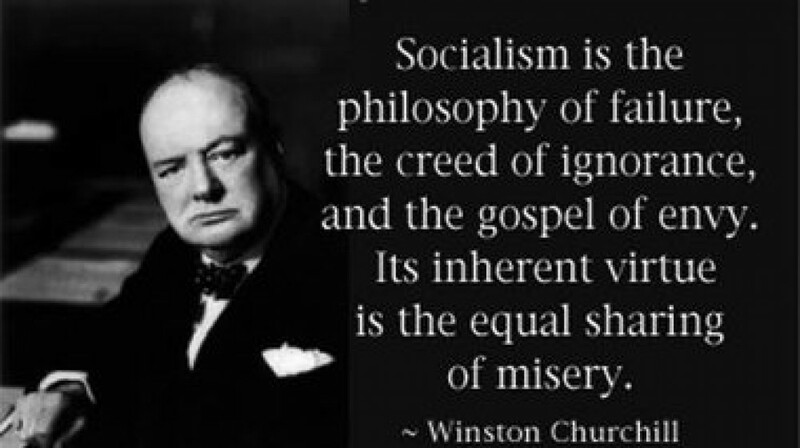 The left has never understood this basic premise when it comes to – well, everything – but especially when it comes to helping the poor. By aggressively inserting itself into the lives of inner city and rural constituencies the federal government has wildly distorted the markets for labor, education, spouse and dignity in America’s poverty-stricken regions. Government intrusions in the form of food stamps, unemployment and Medicaid sound benign at the outset. But consider how these benefits alter incentives for the beneficiary. Is a worker in the inner city more or less likely to ardently search for work when 99 weeks of unemployment are on the table? Is a struggling shop-owner looking to hire two extra workers on the cheap (offering them an opportunity out of poverty, perhaps) going to be more or less likely to do so when the price of labor is arbitrarily raised on him via a minimum-wage increase? Most crucially, are a couple with children more or less likely to stay together when there are no consequences to family dissolution thanks to the ubiquitous welfare state that allows single mothers to collect plenty of money with none of the dignity attached. The $64,000 question is whether the American left, facing its worst political moment in a century (the 1920’s were the last time the party had so few seats in the U.S. House of Representatives and the state legislatures – they were wiped out the last two midterms), chooses to double down on welfare statism or decides to speak honestly and culpably about the failures of their grand experiment in leveraging the public sector to fix poverty. If Democrats really want to speak to the white working class again, or for that matter, the poor and underclass who they today purport to serve, they need to accept that there is one – and only one – proven tool for lifting masses of people out of dismal economic conditions: capitalism. So that’s where we are. The left’s future as I see it depends on their developing a non-transparent and believable appreciation for what makes economies grow. 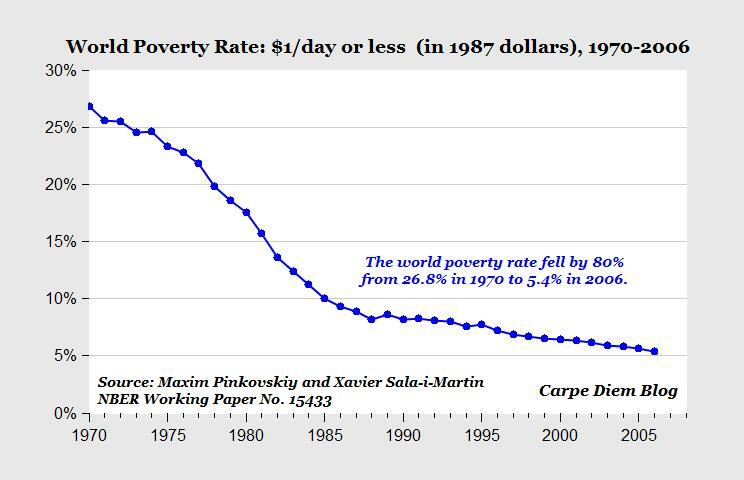 The fact that the global poverty rate fell from 26.8% in 1970 to 5.4% in 2006 due primarily to the introduction of free enterprise and free trade to the rest of the world is entirely lost on the inhabitants of America’s faculty lounges. If they are even aware of this remarkable 80% decline they shrug and attribute it to government aid or something (seriously). Empowering individuals through trade and entrepreneurship is not some fashionable dream concocted by libertarians but the cold hard reality of the how wealth and prosperity are made. The middle and working classes in America aren’t eager to join the poor in the ranks of the dependent class. The poor themselves do not wish to be pandered to and showered with candy while no observable improvements are made in their communities. People are ready for something different, above all in the country’s approach to economics, employment and welfare. The good news is that, for all the lefty hand-wringing (and really, there ought to be more than there is) over losing the white working class, there is no way they are going to suddenly become champions of capitalism and that means the right is well positioned to cast some much needed light on the plight of overlooked and left behind Americans. What about the “97% of scientists” canard which is routinely trotted out in service of the cause as a cudgel to silence critics. What rational person wants to associate with the meager three percent of the population who aren’t with the scientists? Better to go with the flow and trust that the sacred consensus is genuine. Central to the many findings in the report is the account of how billionaire leftists align with the federal bureaucracy to quietly, discreetly, and under cover of media darkness configure the debate on their preferred terms. The myriad 501(c)(4) nonprofit “philanthropy” and “social welfare” environmental groups benefit from substantial funds from the billionaires, who make sure that their tracks are covered and no one ever really knows their level of involvement with shady and militant environmental activism. The ease with which this cabal (Vitter’s term) hides its machinations from the public is not hard to understand. The EPA and it’s 90,000 employees does not overfloweth with small government libertarians. The federal bureaucracy as a whole can be characterized much the same way. There just aren’t a lot of federal bureaucrats who aren’t progressives. Given that the green movement wishes to see government expand, ostensibly to combat climate change but in reality because they are communists/socialists/Marxists (I don’t care what you call them, as long you appreciate that they are driven foremost and forever by anti-capitalism, not love for Gaia), it stands to reason they would find a willing partner in federal bureaucrats. Thus has the Vitter report exposed the byzantine maze of money funneling between billionaire donors and activists and their federally sanctioned 501(c)(4)s. The green lobbying industry and the EPA act as a revolving door while national progressives like Elizabeth Warren inveigh against cronyism. As national media walks in ideological lock-step with cause, they are loathe to shine light on the massive amount of lucre running the climate change circus from afar, which would be merely annoying if progressives didn’t routinely make the same charge about conservatives and dark money and the Koch Brothers. It is the left that is running shady secretive money schemes in this country. The schemes are purposefully kept from public view, as most rational Americans would balk at the idea of European gas prices, yet the left still has the hubris to project that sin on to their opponents, and with a straight face. ““There is no significant man-made global warming at this time, there has been none in the past and there is no reason to fear any in the future,” Coleman writes. “Efforts to prove the theory that carbon dioxide is a significant greenhouse gas and pollutant causing significant warming or weather effects have failed. To wit, it is difficult to imagine a more cynical political movement than the climate alarmists. Every single one of their policy prescriptions calls for more socialism, more regulation, and more government control over society. Folks like Robert Kennedy, Jr. now publicly opine about the need to incarcerate those who do not believe in their great big hoax. Understandably, article after article after article is penned on the burgeoning liberal gulag on the left. It’s hard to come up with a more illiberal movement than environmentalism today. Their science is forged, coerced, generated via groupthink. But their methods have more in common with tyranny than with healthy democratic debate. And when the debate proceeds in a manner not to their liking, they demand the “deniers” shut up or go to jail. There’s nothing more embarrassing than the left’s periodic flirtation with Marxism. Anytime a skeptical critique of capitalism is given a quasi credible veneer, the left goes nuts and forgets that their most successful (and cynical) tactic of the past hundred years has been to hide their very real and very confused hostility towards capitalism and markets. Leftists hate the free market because a) the extent to which they comprehend it is roughly analagous to the depth of Hodor’s vocabulary and b) because free markets and a premium on individualism undermine the left’s sacred fantasy that society can be planned and managed and shaped to fit the majority’s will. The statist mind chooses not to accept the obvious superiority of free market capitalism over all the others because the statist believes, like a child, that perfection is possible in this life and utopia is attainable. Utopia is impossible. Greed and avarice are innate characteristics of human beings. The least bad method for harnessing humanity’s fallible nature is to allow for maximum individual freedom. The absolute worst method for harnessing productive instincts in society is to concentrate power centrally; to trust other fallible human beings with “expertly” administering a just and equal state is to completely ignore all of human history. Leftists refuse to learn the most important lesson: that power corrupts absolutely, that there are no angels among men, and that central planners don’t fail because they have the wrong plan, but because planning (scientific, Marxist, Keynesian, etc) itself cannot work. Ever. Are the progressives right to be so in thrall to Piketty’s work? Is their assumption that millennials and minorities will forever stay wedded to the tribe of identity politics and cultural conformity? Progressives used to genuinely champion freedom of thought and expression, but those days are over. In their pursuit to establish an unassailable culture of “tolerance,” the left has so convinced itself of possessing the moral high ground that it takes for granted that it has become indifferent to its own cynicism. This is how you get scores of bright young intellectuals at places like Mozilla and Brandeis acting like intolerant clowns by reviving timeless leftist traditions like censorship and the thought police. When you carry as an article of faith the smug certainty of your own right-thinking benevolence, you are more likely to turn a blind eye on obnoxious conduct so long as the culprits are on the right “team.” It’s all a long way of saying that I have no idea what the fate of millennial politics is. However, I suspect that Marx is the furthest thing from their minds in 2014, especially when Democrats and their Marxist-sympathizing base have had the run of the capitol for the past six years, and their ideas continue to get worse. As technology makes us more individualistic and libertarian every day, millennial lusting for a return of Marx strikes me as the left’s latest iteration of adorable wishful thinking. More likely, when the economy ultimately improves (a development sure to be delayed until our current regime steps down) and jobs are being created and filled by the chronically unemployed youth, millennials will begin to awaken from their stretched-thin hypnotism and absorb the wisdom that comes to all men with age: that government is incapable of delivering on its promises. Every effort to fulfill its promise serves to crowd out the productive private sector, which slows the economy and prolongs stagnation. Maybe they won’t arrive at this revelation en masse, and maybe it will take longer than I hope for my generation to finally open their eyes to the awful truth of collectivism, but I will be more than a little surprised (and profoundly dismayed) should the millennial generation sustain its dalliance with the identity politics left that demands total fidelity to every aspect of the cause, with heretics put on permanent notice. Among the many problems with critiques of libertarianism from both right and left is the degree to which they confuse principle and pragmatism within the disparate and diffuse arena of libertarian thought. Virtually every hit piece on Rand Paul or libertarianism coming from the likes of Jen Rubin, Commentary, The Weekly Standard, The Washington Free Beacon or other such neoconservative bastions takes the most extreme characterization of non-interventionism and posits that radical isolationism is the norm because libertarian allegiance to the non-aggression principle leads inexorably to a principled and committed stance to never, under any circumstances, use force. Never mind that Rand Paul believes fervently in free trade and global diplomacy and cooperation, qualities that should automatically inoculate one from the “isolationist” slur. He frequently cites how national defense is explicitly framed as the primary duty of the federal government, thus he would not hesitate to use force in a constitutional manner (where Congress regains primacy in the decision). Paul’s foreign policy sounds more realist and pragmatic than non-interventionist, and it is far from “isolationist.” It’s difficult to imagine a Rand Paul presidency converting us to the Swiss or Icelandic model of foreign engagement, postures which would indeed be isolationist. The even-keel Paul suddenly abandoning his George Kennan infused realism for an erratic, withdrawal-at-all-costs, “leave us alone” retrenchment seems as likely as his giving us the final installment in an Iraq War trilogy. Still, the isolationist pejorative persists because the forces arrayed against Paul on the right stand in rabid opposition to him, simply because he dares to criticize their worldview. It is much easier to slander libertarians as isolationist and equate them with leftists than to actually engage with the criticisms and perhaps be forced into some painful soul-searching. In this regard, neocons mirror progressives, in that their reticence to acknowledge real failures in their foreign policy mirrors the left’s reluctance to acknowledge failures in their war on poverty, the welfare state, economics or healthcare. People hate credible challenges to their ideological dogma, which is why elements of left and right are lashing out at Rand Paul, the bearer of bad news. Right now the attacks from the right are more noxious and unhinged than the average panicked screed from the left. But the left is no less in error in its critique of libertarianism when it states emphatically that a philosophical hypothetical about the Civil Rights Act of 1964 or Paul’s position on abortion (as if he’s going to be eager to federally ban the practice as POTUS; much more likely he would adopt a state’s rights/federalism stance) will, ipso facto, automatically disqualify him with 100% of the Obama coalition. But can the left really be that confident that the whole bloc of Obama millennials is going to catch the fever for Hillary the same way they did for Obama? Listen to Robert Scheer’s hour long paean to libertarian consistency in fighting crony capitalism in which he declares proudly that Rand Paul would have to be his choice against Hillary Clinton. So we’ve got a principled democratic socialist sounding off on the consistent, principled, laudable positions of Rand Paul and libertarians, and doing so in the context of Paul’s raucous reception from millennials at Berkeley. But we’re supposed to accept the smug liberal wisdom that insists Paul’s attraction to young people is all just a a mirage, because abortion. Please. In the process of assuring the Bay Area radio audience that he was not a libertarian but a committed liberal who believes in “throwing money at the problem” and “leveling the playing field,” Scheer regaled his skeptical host and listeners with as robust a defense of libertarianism that you are likely to ever hear from someone on the left. He celebrates their consistent contempt for corporatist privilege, applauds the consistent belief in avoiding imperial temptations such as “nation building,” and even pushes back on the naive leftist assertion that libertarians are in bed with the “1 percent” and favor accelerating inequality by pointing out that it was in fact Bill Clinton’s affinity for crony capitalism, the notorious Wall St-Washington D.C. revolving door and the left’s coziness with the Federal Reserve that are chiefly responsible for growing inequality. I don’t necessarily agree with Scheer’s diagnosis, particularly regarding his claim that the repeal of Glass-Steagall was the high crime of the century, but he is surely correct to highlight that nowhere are libertarian policy prescriptions to blame for the economic turmoil of the past decade. I most certainly would not agree with Scheer’s antidote to the so-called inequality “crisis” either, as only stable economic growth in the private economy can enhance prosperity for all (though of course not uniformly; thus even with growth, you will always have “income inequality,” which shouldn’t even be “a thing” in our modern lexicon), but it is beyond refreshing to hear someone on the left instructing fellow travelers to train their ire at the bipartisan duopoly of cronies responsible for the rigged (and ongoing) Big Business-Big Government tryst, not at the libertarians who, Scheer recognizes, are not to be lamented but lauded for adhering to principle in earnest and with consistency. Scheer also makes a crucial point in this interview about the need for the modern left to come to terms with totalitarian socialism. Though I would argue with him that there really isn’t that much of a difference between democratic and totalitarian socialism, as any system oriented around central planning and expert maintenance of an economy is ultimately going to end in tyranny, whether it begins with democratic elections or not. Managed economies are confused societies, and confused societies are chaotic and prone to corruption, abuse and authoritarianism. Still, how encouraging to actually hear a socialist suggesting that not enough socialists have come to grips with the most abhorrent socialist outcomes? I get the feeling that Mr. Scheer is uncomfortably aware of his own ideology’s shortcomings when it comes to the actual administration of government; that it is impossible to ignore that socialist regimes inevitably abuse the power they seek to consolidate. While most journalists have been reliably liberal in their politics for decades, the culture of the profession has always valued an “agin’ the government” mentality in which all politicians are viewed with cynicism. So long as even liberal journalists regard it as their duty to ferret out stories about corruption, mismanagement and failure within the government, we can feel safe that no administration, even one that is favored by the left, will escape the scrutiny necessary to provide accountability. But there is little doubt that this has begun to change since Obama came to office. After the media hammered both Bill Clinton and George W. Bush throughout their presidencies, Obama has had it relatively easy. Part of it is due to the special hold that this historic president has over liberals… The culture at CBS and like-minded outlets is to see any aggressive reporting about the president and his policies as evidence of wrong thinking rather than part of their obligation to ask uncomfortable questions and speak truth to power. Is there any doubt that a vast majority of American media fall into this category? Is it any wonder that most of these Ivy-educated, Beltway-bred, coastal elitists who were so keen to speak truth to power (when power had an (R) next to it) are now willing participants in state-sanctioned ideological propaganda? Of course there are scores of principled leftists like Kevin Gosztola, William Saletan and (perhaps) David Sirota, but the bulk of progressives in media today are more likely to be animated by hostile caricatures of the right and to seek out “evidence of wrong thinking” than by actual truth. As I’ve recounted before, the left is complicit in government propaganda because exaltation of big, activist government is the only direction their ideology leads. It remains their Big Idea despite the fact that the intellectual and practical justifications for it were eviscerated by… well, the twentieth century. I do not much blame the Left for hesitating to talk about Big Ideas. The Left has been losing the Big Idea debate for a generation or more, in no small part because its last Big Idea killed 100 million people, give or take, and not in Mr. Klein’s projecting-abstractly-from-a-CBO-study way but in the concentration-camps-and-hunger-terror way. Marxism was the Left’s Big Idea for the better part of a century, and its collapse — which was moral, economic, political, and complete — left a howling void in the Left’s intellectual universe. Nothing has quite managed to fill it: In the immediate wake of the collapse of Communism, the anticapitalists sought shelter in a variety of movements, few of which grew to be of any real consequence, with the exception of the environmentalist movement. But the lenten self-mortification implied by a consistent environmentalist ethic has limited that movement’s appeal as a governing philosophy and an individual ethic both, hence its fragmentation into a motley sprawl of mini-crusades. It is easy to be anti-fracking when that does not require you to give up anything, easy to oppose the expansion of the Keystone pipeline network when you can be confident that the gas pumps in your hometown will always be full, easy for well-off Whole Foods shoppers to abominate varieties of grain that are possessed by evil spirits or cooties or whatever it is this week. Williamson earns my Hero of the Moment award (and not for the first time) for astutely calling out Jon Stewart as “the leading voice of the half-bright Left because he is a master practitioner of the art of half-bright vitriolic denunciation,” which can just as easily be used to describe the left-at-large. Robbed of their Big Ideas (don’t get any), the left plays a politics of vilification. Without much of an intellectual or philosophical foundation to rely on, the left operates almost entirely out of pragmatic rather than principled concern. Sure, vague paeans to “equality” and “social justice” can be mistaken for principled stances, but do not be fooled; the left’s drive for egalitarianism is always premised on the notion that society is unjust and only government (with the right experts – themselves – at the helm) can eradicate the injustice. Thus the welfare state and redistribution programs that sound like principled desires for a “fair” society are really just the pragmatic means for producing the ultimate end: power. As to the question of what progressives want with power, the ends are up for debate, but the means never are. People like myself who look askance at progressives assume (not without justification) that a not-insignificant cadre wishes to use government solely to grab power. This group knows that the left’s “coalition” of voters who are susceptible to promises of government-as-panacea must be consistently pandered to, whereas other progressives indeed wish to bring about positive change with their power but unfortunately lack the wherewithal to deliver. The disparate factions of progressivism envision different ends, yet they embrace the same means, the means of vilification. Which brings us to Paul Ryan. Liberals who have complicity in the problems plaguing America’s inner cities are attempting to make an honest conversation about poverty impossible. They are signaling that they intend to try to take out Republicans who want to address some of the root causes, the behavioral causes, of poverty. As a posterchild for the left’s psychotic narrative that says Republicans hate the elderly, the poor, the middle class, women, the gays, minorities, puppies, ice cream and orgasms, Ryan knows how the left operate when they have someone in their crosshairs. As the primary budget scion among House conservatives, Ryan is persona non grata for progressives because he represents a sober, green eye-shade accounting of their fiscal failures, and they will do whatever they can to forestall the reckoning. This is how Ryan is cast as He Who Throws Granny Off Cliff or as factually challenged or even as equivalent to the evil British purveyors of the Irish Potato Famine. The left trashes Ryan and “fact-checks” him into oblivion because they are terrified of his policies ever seeing the light of day since a Ryan fiscal reform would mean the beginning of the end of the progressive project. If Ryan is successful in restoring a baseline of sanity to Washington-as-usual (and “baseline budgeting” is a great place to start), the left’s budget gimmicks and procedural theatrics will no longer matter once actual accounting is again the standard. They know this, so they react accordingly, with wave after wave of dishonest attack, in the same vein as they went after Romney. I’ve learned not to underestimate the capacity of the modern left to defame genuinely good and decent men like Ryan and Romney, who because of the threat they posed to the immoral and unsustainable government gravy train, had to have their characters assassinated. Nothing is more important than the ultimate agenda, and if a little shameless vilification of decent people is needed to keep the progressive train on the tracks, so be it. And yet there was Paul Ryan at CPAC, proudly proclaiming that the left is exhausted because they are out of ideas. The left hasn’t really had any ideas since the official failure of their Big Idea almost twenty-five years ago. They are resigned to playing identity politics and pandering for votes until such time as free-thinking citizens wise up and hand them a decisive defeat, or else until they run out of other people’s money.